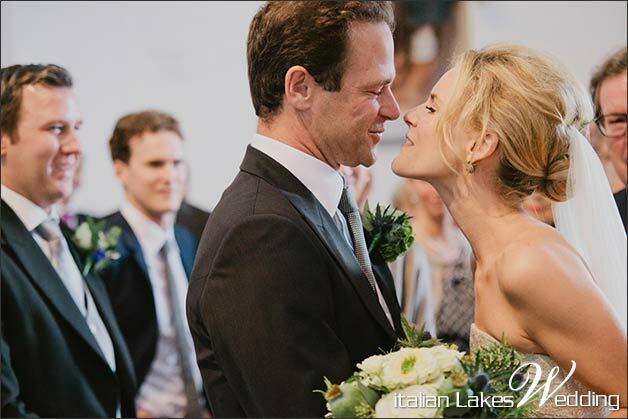 ’m pleased to get back to Lake Maggiore for a wonderful country chic event: Barbara and Hansi’s wedding . 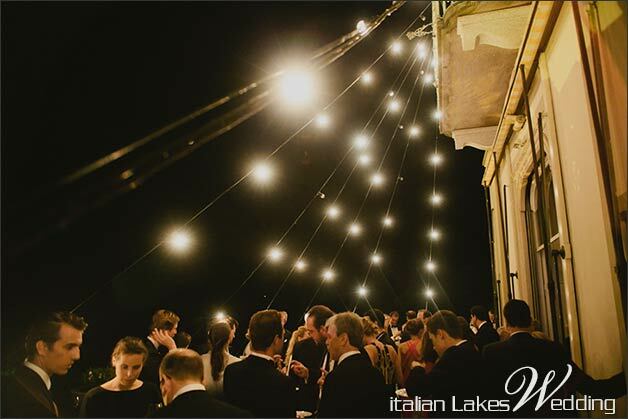 Lake Maggiore could be a wonderful scenery for a late Summer event: a wonderful church overlooking the Lake, a refreshing and happy aperitif in a garden and a wonderful and elegant evening party at Villa Muggia overlooking the lake. Wonderful choices for a wonderful couple. Barbara and Hansi both come from Austria. 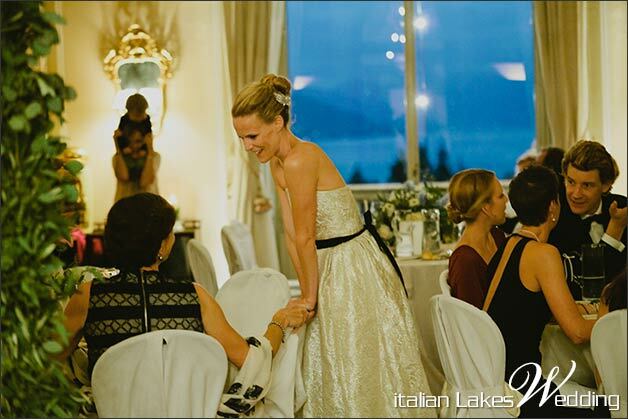 They chose Lake Maggiore for their special day as Barbara used to come here in vacation when she was a kid. 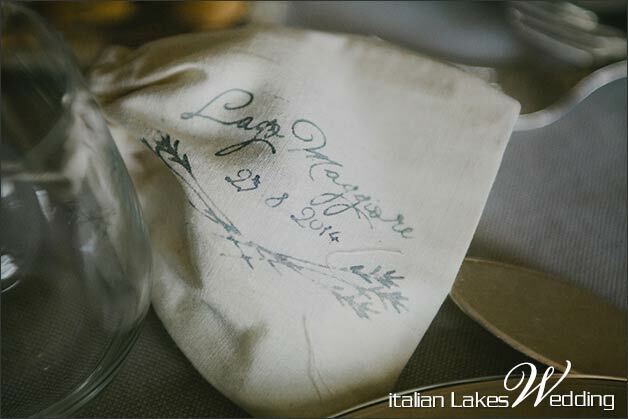 She has wonderful memories of the location and she could not choose a different destination for her wedding in Italy. 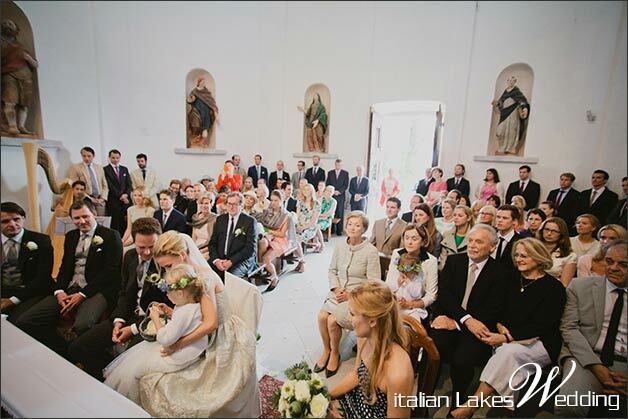 Barbara and Hansi chose a Catholic ceremony. After some researches we opted for Church of Sacro Monte di Ghiffa. 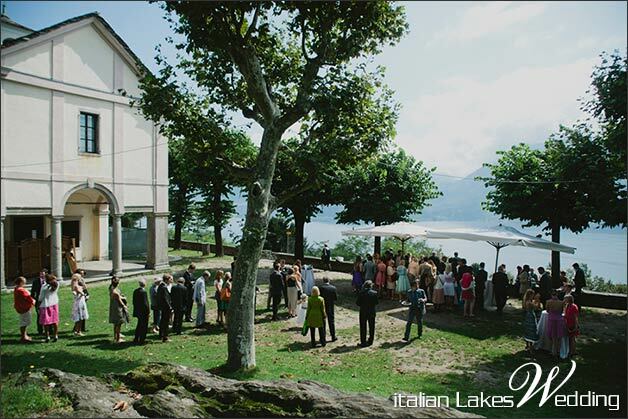 The venue is located not far from Verbania village on top of a hill in a full natural contexts. 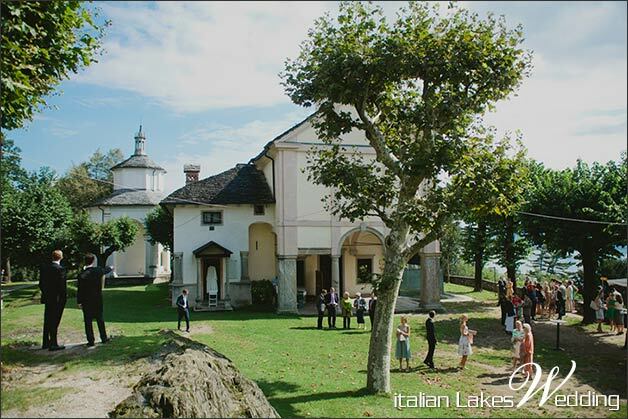 On the hill of Sacro Monte there is a little group of churches and chapels that could be ideal for a romantic catholic ceremony overlooking Lake Maggiore. View is simply stunning! 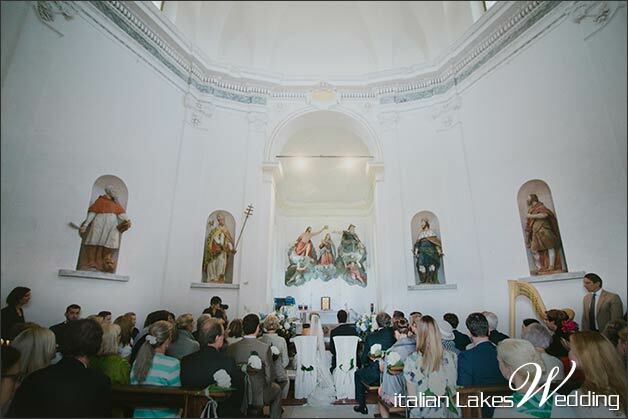 Barbara and Hansi’s catholic ceremony was performed in the highest chapel of the complex in a sunny morning of the end of August. A lot of friends and family members came from Austria and other countries to be on Lake Maggiore with Hansi and Barbara. Hansi and his groomsmen were very smart and Barbara was absolutely enchanting. She is a blonde beautiful girl and her romantic dress enhanced her innate elegance. The sound of a harpist accompanied a moving ceremony. For her floral decorations Barbara chose green and white hydrangeas for the church. 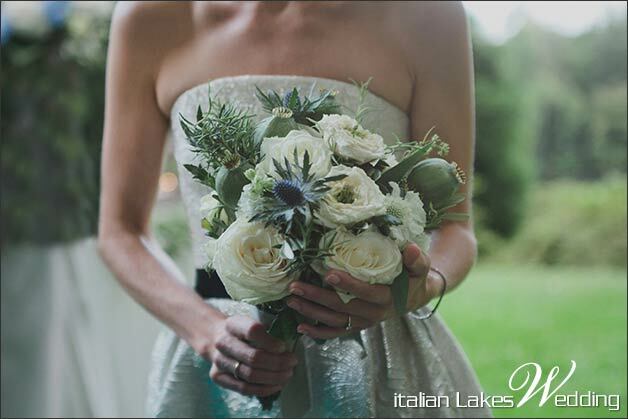 For her bouquet she choose a very original mix of romantic and country elements: Sea Holly (Eringium), Roses, Rosmarinum and Lotus Fruits. 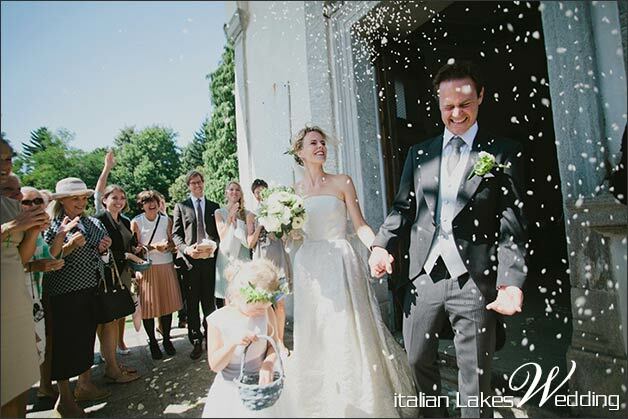 At the exit of the church all guests waited our newlyweds tossing rice and petals to wish them good luck as per Italian tradition. A delicious aperitif was waiting for all after the service in the big lawn of Sacro Monte. 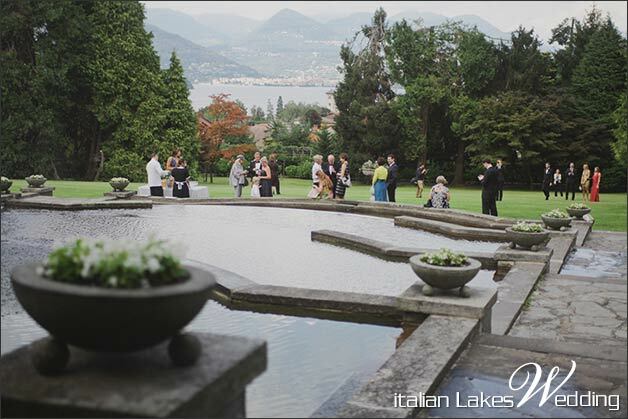 It was is a very good idea to take some time to relax, mingle with guests and have some stunning photos overlooking Lake Maggiore. 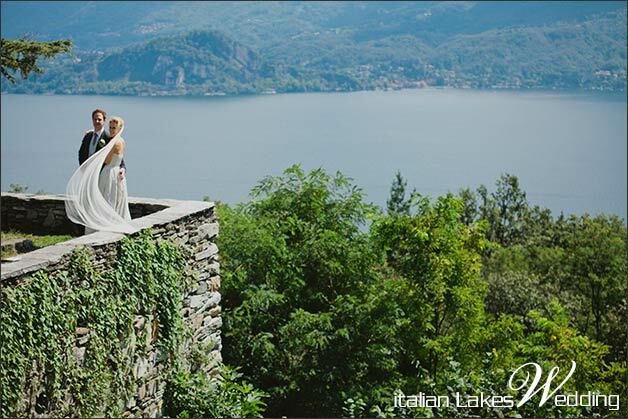 Mountains, waters of the lake and Sacro Monte park could be the perfect setting for romantic shots. Have a look to beautiful pictures Pure White Photography took. 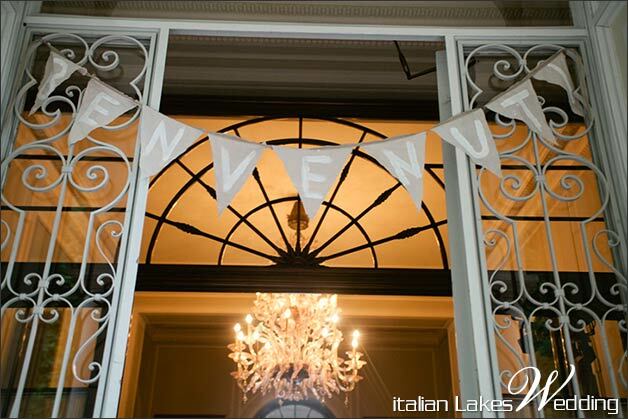 All guests had a lovely and happy time enjoying delicious canapés and finger foods and sipping Italian Prosecco. After the aperitif Barbara and Hansi offered to all guests a wonderful boat trip on the Lake. Beers and other drinks were served on board to make the trip more entertaining for all. 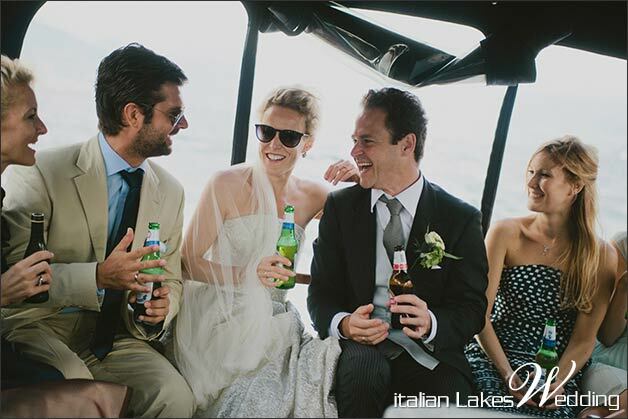 A boat trip on the lake is a wonderful way to plan a transfers from ceremony venue to reception venue. A boat trip is not only a transfer but a real experience that everybody will love. Seeing the Lake, Borromeo Islands and the coast from the waters is simply beautiful. 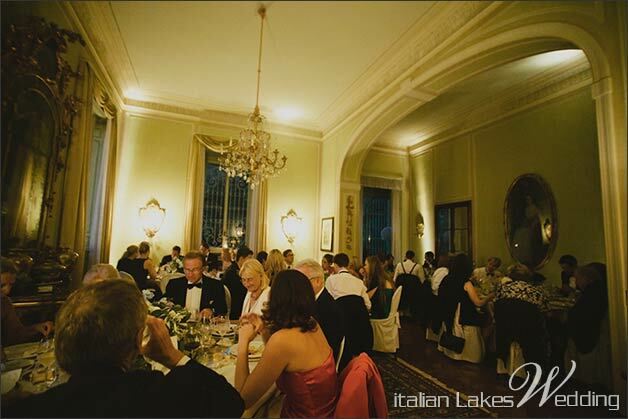 After a little break to refresh and change dresses for the evening party, everybody reached Villa Muggia in elegant town of Stresa for the reception. 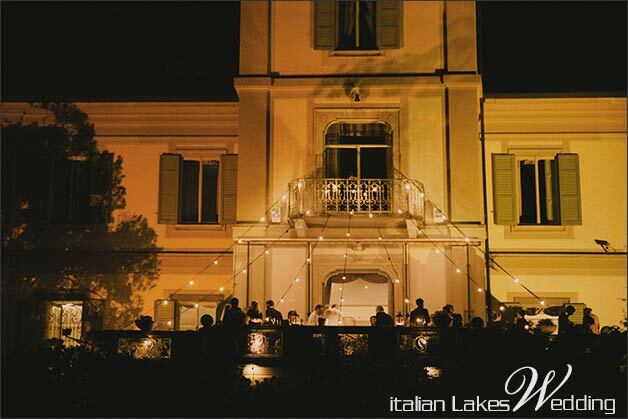 Welcome aperitif were served in the big lawn of the villa embellished by secular trees and a stunning fountain. 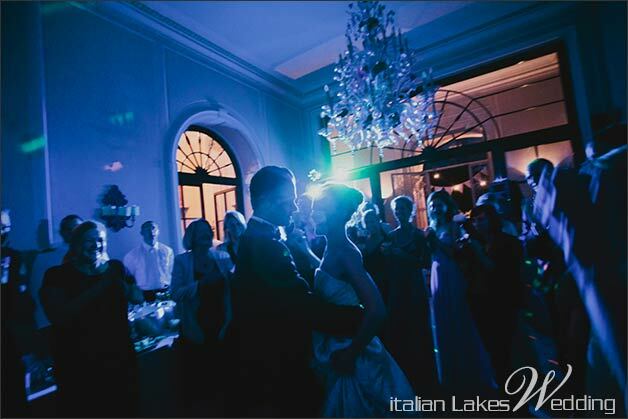 The Villa Barbara and Hansi chose for their reception is located just in Stresa village. Villa Muggia it was built back in 1800 and during 1900 it was owned by Siemens family. 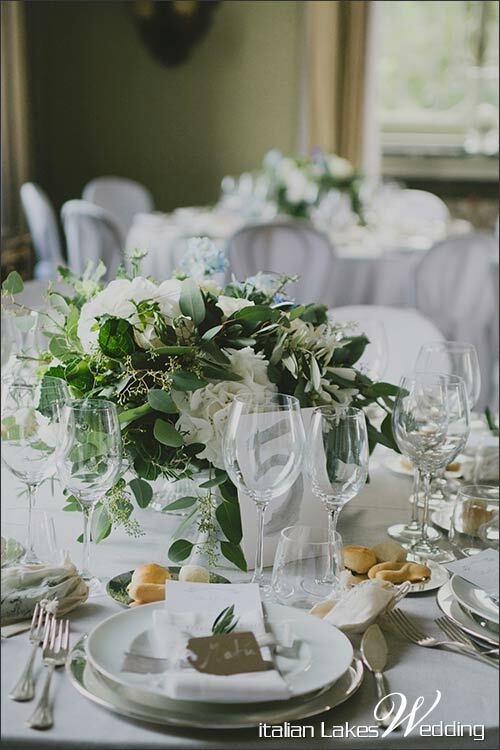 It has an amazing park a wide marquee and beautiful rooms indoor for wedding receptions but also some others on the first and second floors for overnight accommodation. 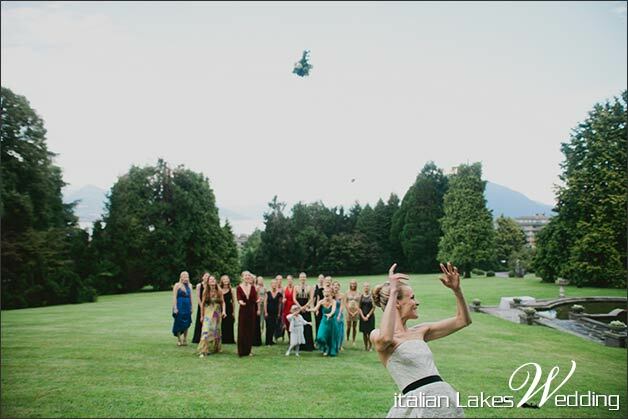 Before seated wedding meal, Barbara throw her bouquet to all single ladies in the park and then elegant meal could start. 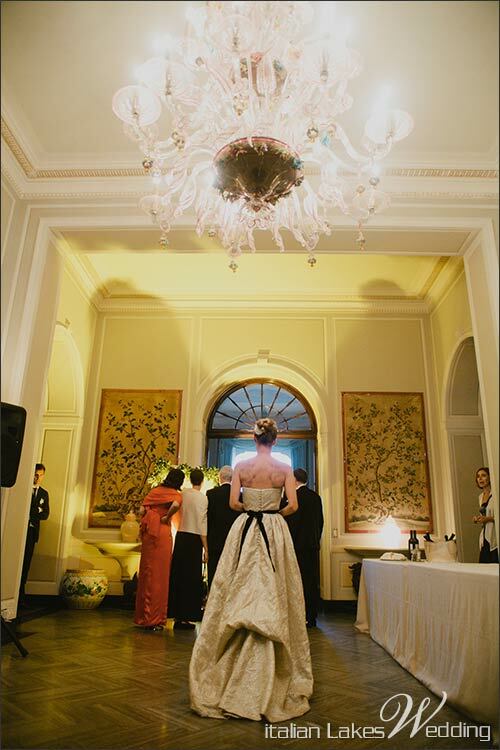 The villa has a wonderful marquee that could be ideal for outdoor reception but in this case Barbara and Hansi chose the rooms indoor for their special dinner. Rooms are finely decorated with frescos, paintings, precious antique chandeliers and appliqués that make the room very chic. For the evening dinner men wore tuxedos and ladies wore long evening gowns. 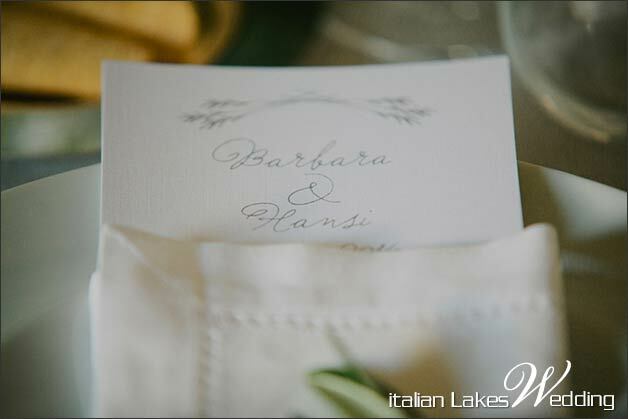 Barbara is a graphic designer and she created her own wedding stationary. 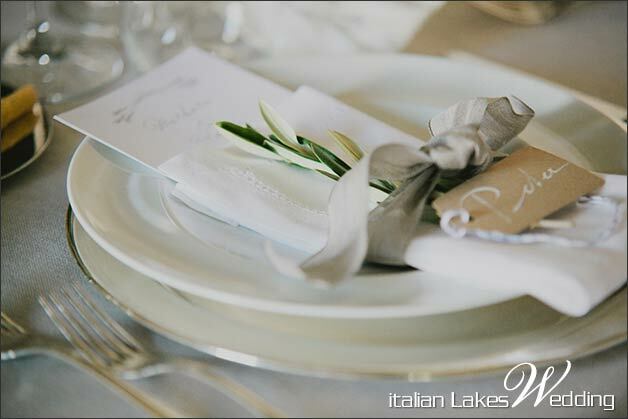 You can see some lovely details in these pictures by Pure White Photography. 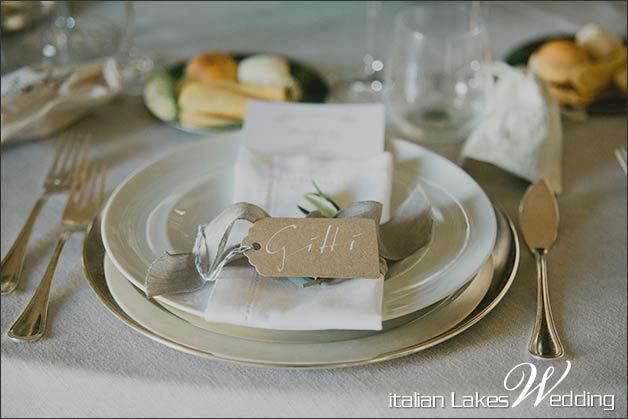 Grey precious paper for the table plan and tables numbers, natural organic paper for names cards and buntings, cotton ribbons for napkins and cotton bags for favours. Tables were very elegant and refined. Trés Chic! After the meal Barbara’s sister planned a wonderful surprise for all! 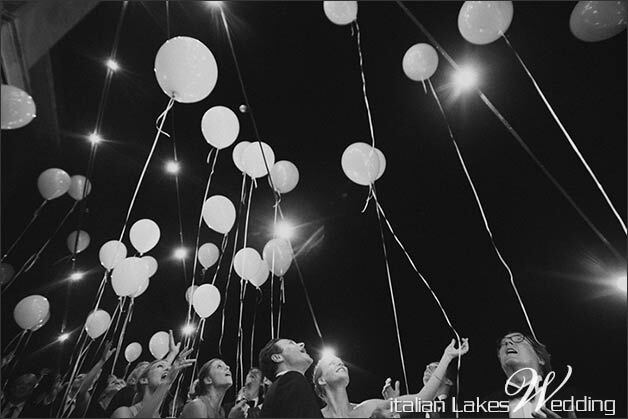 Hundreds of balloons to release in the air right after the wedding cake cut. 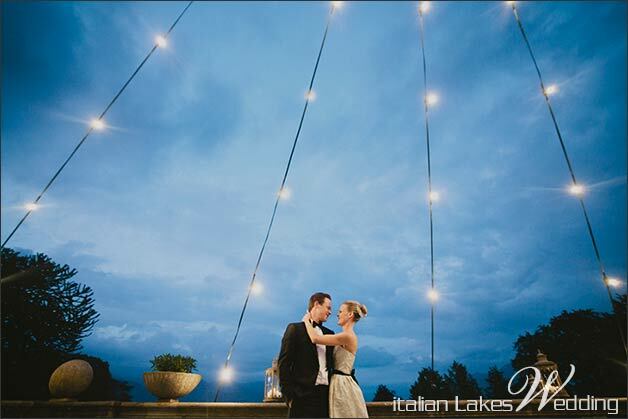 A very romantic idea to close reception dinner. Balloons are fully biodegradable and less dangerous than flying Chinese lanterns that in many locations on Lake District are forbidden. What a fabulous idea!! Everybody loved it! The party went on with lots of dances and fun. For the party the villa was decorated with dancing architectural lighting. Dancing lights indoor and romantic fairy lights with bulbs outdoor, that made the atmosphere once again incredibly romantic! 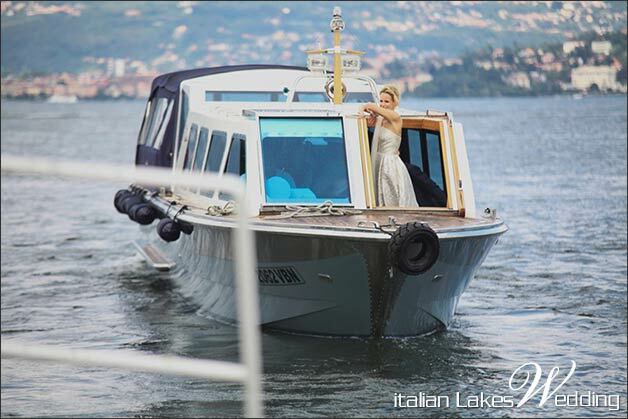 What an amazing day on Lake Maggiore, and congratulations to Barbara and Hansi! A very special thanks to Pure White Photography for these amazing shots! They truly took the atmosphere of the event! Another special thanks to my lovely colleague Stefania Zen. 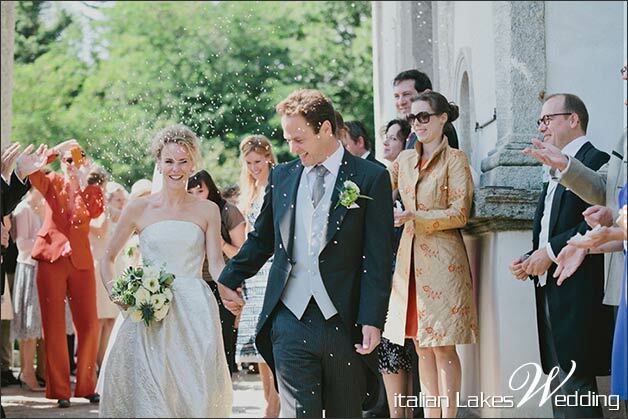 As you all know she works on Lake Bracciano and Rome surroundings, and now in Umbria Countryside and Lake Trasimeno too – Congratulations! 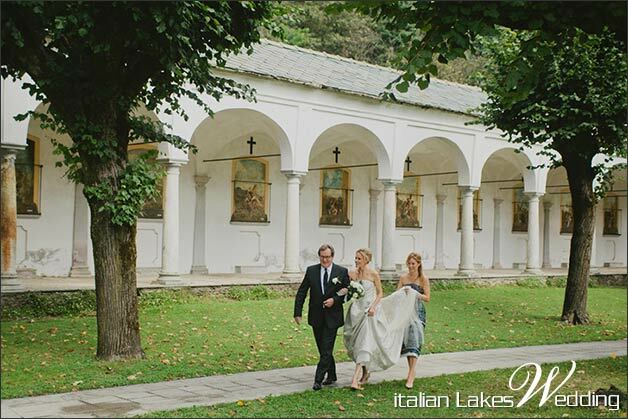 Stefania and I often work together on weddings we plan in both the areas we follow. I could not imagine planning this event without her help! Thanks!